This is another one of those BD00 posts where the dorky picture effortlessly drew itself, but an accompanying, plausible narrative did not reveal itself. These word clusters came to mind during the chaotic process of creation, but I gave up attempting to iteratively structure and weave them together into anything semi-sane: “role distinction“, “bottom-up vs. top-down evolution“, “dumb, uniform components vs smart, diverse components“, “enduring vs. fragile foundation“, “excessive control“, “caste system“. What words come to mind when you peruse the picture? Can can you fuse a story line with the picture? Please help me with the narrative, dear reader. Secrete your creative hormones on the problem at hand. Revel in the possibility of making sense out of nonsense. Like Elton John’s music goes with Bernie Taupin’s words, we can have your words go with BD00’s dorky picture. Of course, like the one or two other posts similar to this that I’ve hatched in the past, I don’t expect any takers. Along with a whole bunch of co-workers, I’m a member of the professional networking site linkedin.com. It’s a great site and I highly recommend it. It’s interesting to browse through the profiles on LinkedIn. Everybody’s a freakin’ manager, or director, or chief-this, or chief-that. However, when you read their accomplishments, you can’t tell what the freak they’ve done. They seem to mostly describe the functions of the org areas that they’ve worked in. WTF? Of course, I don’t have any facts (I only use facts when they bolster my argument and I auto-reject all others 🙂 ), but I’d bet the farm that most of these people don’t direct or manage anyone and they haven’t done squat in years. They’re each, OMG!, a dreaded individual contributor. I picture them, perhaps wrongly, walking around flaunting their titles, manipulating people (instead of helping them to develop and grow) and barking out non-sensical orders that they’ve pulled out of their arses. They behave this way to look/feel important and they actually fool a few people for a while. It’s sad, because I think that at the core of their souls, all people want to do the right thing for all. However, the shining light at their core has been trapped in no man’s land by layer upon layer of ego. 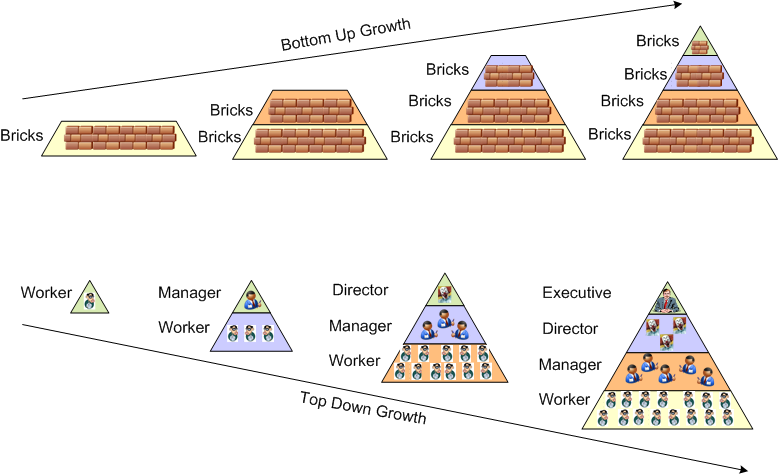 The culprit behind ego inflation in the corpo world is a dysfunctional org structure. Specifically, it’s the obsolete 150 year old pyramidal, hierarchical structure of entitlement that all dinosaur corpo citadels pay homage to. “Enough with the rant, got any alternative ideas smarty pants”? How can you mobilize a large group of people to change the world and prevent chaos from reigning without a corpo pyramidal caste system? One way is to organize as, and more importantly, operate in accordance with, a circular ring structure where all rings are directly connected with robust and high bandwidth communication channels. Instead of managers in the inner rings, there are leaders. Leaders focus more on developing people instead of enriching themselves. So you say that the multi-ring design is nothing more than a squashed hierarchy with the innermost node representing the CEO? You’re literally right, but not figuratively. The main reason for operating your org structure as a flat concentric set of rings is to eradicate the deeply ingrained 1000s of years old “I’m better than you because I’m higher up in the food chain” mindset that unconsciously pervades all hierarchies. Sure, the people residing on the inner rings still have the responsibility to make org-wide decisions, but they do so with a more down-to-earth and people-centric mindset. A non-conforming, ring-based company organization can’t possibly work, right? Blasphemy and off with my head! I know of at least one company that’s successfully implemented the “ringo star”. Semco Inc. of Brazil. If it piques your interest, Google them and/or check out the articles bookmarked in this twine: The Magic of Semco.